Unbelievable! 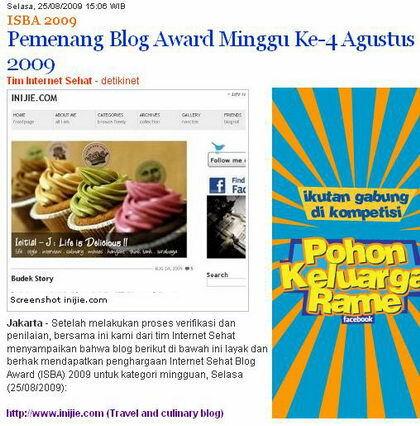 On the 4th week of August, INIJIE.com win as the best blog in food and travel category of Internet Sehat Blog Award (ISBA) 2009. I feel so happy even it’s just a weekly award. 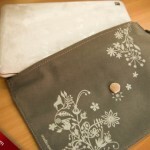 Honestly I had forgotten about this competition since I didn’t win it after the competition rolled for couple months. Thank you all Initialers who help me sent numerous amount of email support to the award committee. I owe you MUCH. Arigato Gozaimas..
Ps : Keep the spirit UP during RAMADHAN. Cia yooo! Selamat Jie! Semakin mantap aja status seleb blog-nya. ciyehh.. menang jo.. congrats ya ko..
tp memang blog lu top kok, itu harus diakui :). @Zee : ahhhh.. masih lebih top markotop tehsusu.com lahhh hihi..
Nice. AKu doaken dapet beri item maaas!! AMEN!